Those who were following the automotive industry in the 1960s and 70s will remember the 1978 Ford Mustang King Cobra, a drag racing monster that featured a 302 cubic inch (5 litre) V8 mill producing an astounding… 139 horsepower. With it, the King Cobra could blast through the quarter-mile in 17 seconds flat. This is why, when Ford chose to present a new car that would strike fear in the heart of its competitors at the sight of it, they did not have to look far for a name. From among a slew of historic nameplates (Cobra Jet, BOSS, Mach 1…), they chose the regal reptile to represent the newest high-performance pony car. Enough hyperbole: the new Mustang King Cobra shows what you can accomplish if you modify a Mustang GT using only Ford parts. 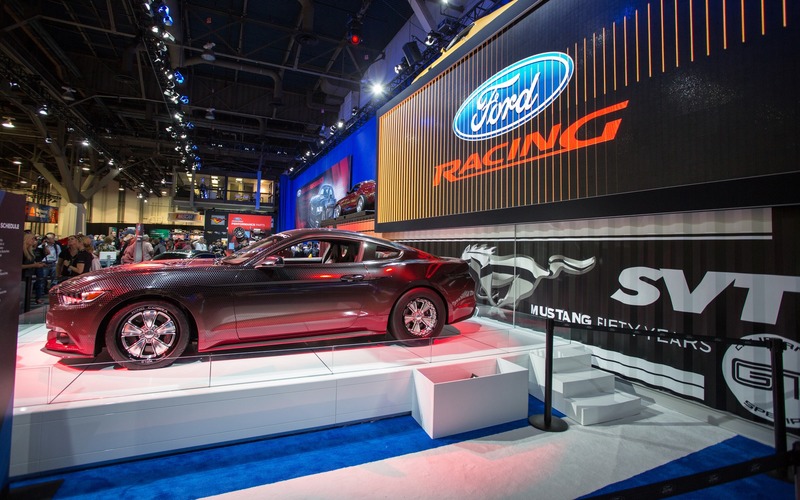 The car features the whole Ford Performance book for the 2015 Mustang, which means it has stronger half-shafts, a new rear subframe, a lowering kit, new rear shocks and stabilizer bars, a new fuel injection and air intake system, different computer and a 2.3 litre supercharger. This supposedly means over 600 horsepower, which are all sent to the wheels via a pair of slick tires. The King Cobra can run the quarter mile in 10.97 seconds. The car won’t be available as-is, but it’s possible to build one using the Ford Racing catalogue.